Crown’s XTi family of amplifiers defines the standard for portable PA systems with unmatched performance, technology and power-to-the-people affordability that delivers the goods night after night without even breaking a sweat. 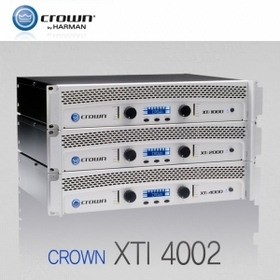 There’s no debate — when you choose Crown’s XTi Series, you’re choosing one of the most powerful and efficient amplifiers on the market today. How do we do it? With innovations designed to simplify your life and rock their world. Innovations like integrated DSP that allows you to quickly and easily configure crossovers, EQ, limiting and delay, along with tools like a pink noise generator, subharmonic synthesizer, and universal tracking switch-mode power supply, which reduces power draw and waste heat. And as the first Crown amps to use Icepak™ thermal modeling software, they are at the top of their class when it comes to thermal efficiency and lightweight portability. XTi 1000: 6.8A, XTi 2000: 8.3A, XTi 4000: 10.5A; at idle draws no more than 30 watts. XTi 6000: 15.3A; at idle draws no more than 180 watts. XTi 1000: 30.5 dB. XTi 2000: 32.9 dB. XTi 4000: 34.2 dB. XTi 6000: 37.1 dB.